Audinate's Dante evaluation and development kitThe newcomer in professional audio transports, Dante is the rumble from down under's Audinate. 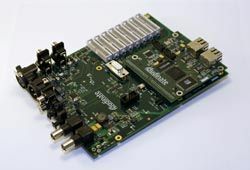 Quietly appearing on the scene at AES 2006, Dante has its roots from the Australian government technology incubator NICTA starting in 2003 and technologists from the telecom and zero configuration networking community as opposed to the audio industry. Dante's ability to support varying (and very low) latencies, IP routability, automatic device-discovery, the use of text-based channel-and device-"friendly names", and its ability to make your favorite PC or Mac audio software application look like just another Dante-enabled device to the network via software drivers (no special hardware required, utilizing standard ethernet interface) has brought it much attention very quickly. The biggest challenge for Dante is not technical, but its "new kid" status. -Multiple sample rates and bit depths on same network? -Multi-Unicast - Multiple unicast transmissions?